Explore the links below to find out more about this beautiful city, its people and its stunning surroundings. B. Carmichael & Company Inc.
You may want to head north to Crawford Bay where you can take a free ride on the Osprey 2000. This ferry trip takes about 45 minutes, so add this to your driving time. Also in busy summer times you may have to wait an extra ferry sailing. Having said this there are beaches to walk, sometimes vendors at the parking area and drinks to purchase, plus it can be a relaxing break in your journey. The scenery is absolutely stupendous and this alone is worth making the trip! Cranbrook Airport offers international flights providing a new portal into the Kootenay region. 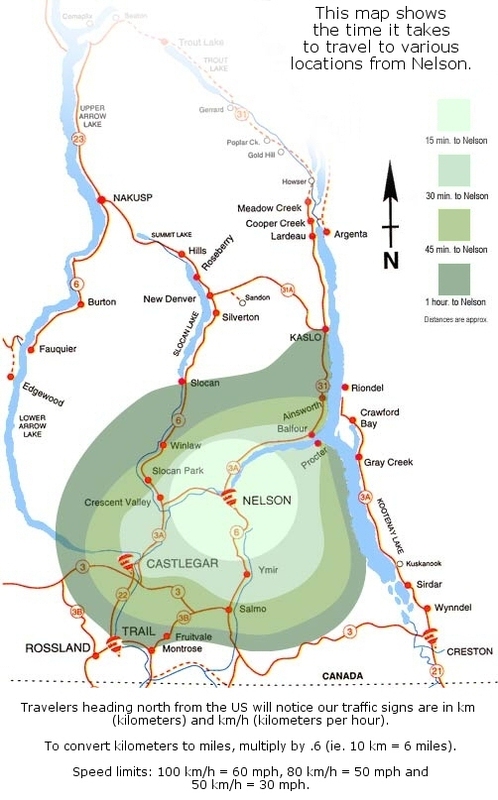 Castlegar Airport is 30 minutes drive to Nelson and our closest commercial airport. Trail Airport offers service from Pacific Coastal Airlines. Watch for wildlife on our roads It is a pleasure to animals but not up close and personal with our vehicles. It is common to see herds of deer, elk or the odd bear on the roads, this becomes particularly more dangerous a after dark so please slow down and take your time. Please don’t feed the bears! Enjoy your trip and be sure to contact your home host, hotel, or RE/MAX RHC Realtor® so they know when to expect you! Daily service by bus & charter / private service by small aircraft to Nelson Airport are available. (30 minutes by road) daily.